I just bought the game and played it several times with adults and with 2nd, 3rd, and 5th graders. It is great fun and very simple to understand and play. The goal is to be the first to identify a match on a pair of cards and to call out out the name of the figure in common. It is exciting to spot the match, frustrating to know there is a match which one cannot see, and disappointing when one is beaten to the punch. The game keeps everyone engaged. All the children laughed as we played, and all wanted to play again and again. And the youngest (7) and oldest (65) of us were winners. What more could one want for a summer game at the beach?!! If you lose a card or two the game is still just as good. The game says it’s for 7 and up and is billed as mostly an adult party game. But I have to say, my 4 year old LOVES it. We have only played “The Tower” version of the rules – where each player has one card and tries to spot their matching symbol on the top card of the pile as soon as it is turned face up. The first time we played it, we (the adults) would close their eyes and not look at the center card while we counted to 5. This allowed our daughter to have a head start since her visual discrimination skills are not nearly as developed as ours. Each time we played the game, we ended up counting to a lower number until finally, she didn’t need any lead time at all. 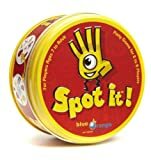 I highly recommend this game to parents of preschoolers, early grade schoolers, and any kids with reading difficulties. Being able to quickly spot the differences in letters, to decide if it’s a “b”, “d”, or even a “p” is critical to being able to read. This is a fun way to boost those skills as well as a fun way to spend time as a family. We got this game to take with us on a family trip and it has quickly become a fave around our house. It’s hard to find games the whole family can play (Our kids are 4 and 8). There are several different ways you can play and every hand is different, so you don’t get bored. It is also small and even fits in my purse, so it travels well and makes a great game to take to restaurants or the doctors’ office (anywhere you might have to wait).